Becoming a mother is a life-changer. When I found out that I'm about to have a child, I was scared because I knew this would bring about a lot of changes in my life. Some of these changes include no longer being invited to drinking sessions, and just staying at home taking care of the children. Change is not a bad thing. In fact, parenthood has made me a better person than I was I think xD. 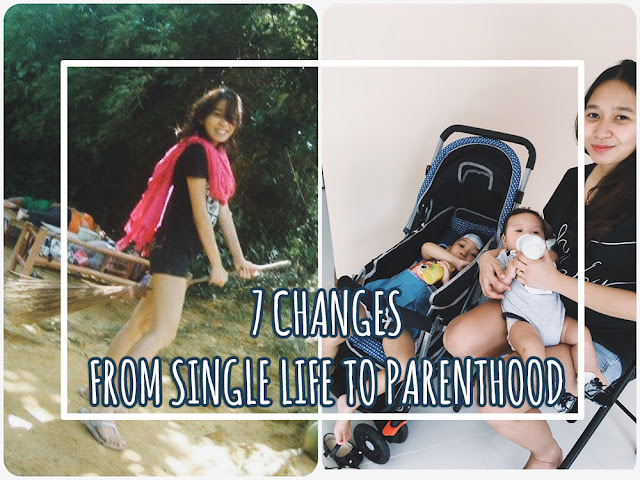 So what are these changes in my life when I became a parent? Asides from acquiring stretchmarks and baby belly, here are some noticeable changes that happened to me from single life to parenthood. Single Life. Staying late at night would mean drinking out with friends, singing our hearts out at karaoke, attending concerts or other social events, watching movies, and endless surfing on the internet. Nighttime seemed short when I was having fun. I used to think that nighttime is wasted on sleep. Parenthood. Staying late at night as a parent means the toddler is all energetic and won't go to bed yet. Or could be because she's sick and I need to attend to all her crankiness needs. Baby gets hungry every two (2) hours or so and I need to get up to nurse him. Nighttime seems shorter cause I feel like I haven't gotten enough sleep at all. Single Life. Facebook. Instagram. Twitter. Photo-editing apps. Game apps. Basically stuff that kept me from getting bored. Single Life. Back when I was single, I don't really do groceries. I only do if there are upcoming events or out-of-town-trips. I also don't like to go to department stores or any boutiques for shopping. Parenthood. Now that I'm a parent, groceries would mean having to buy diapers, and milk! Whenever the husband says we're going shopping, the first place I would love to go is the kids section of the department store! I'd be all heart eyes with all the nice-to-have baby and toddler stuff. Single Life. Going out doesn't require too much preparation. As long as I'm available and I have sufficient cash, then off I go. Extra clothes were always ready inside my car whenever there will be sudden overnights. Parenthood. A day out with the children would mean having to carry double since I have to bring my own stuff and my kids'. In fact, 90% of my bag would be baby and toddler stuff. And then I would have to take the place into careful consideration: Will it be child-friendly? Will little Akisa like it there? Will Bae Blake feel comfortable? Single Life. My room was a little cramped. It looked like a stockroom because a lot of unused stuff goes in there. I didn't really mind all of the mess as long as I still have some space to sleep on. Parenthood. Since we're co-sleeping with our children, an area is specially allocated for them. Asides from having a husband who hates a room full of clutter, I had to keep things in order so that the room will be kid-friendly. Single Life. Facebook and Instagram contained rants and raves and selfies with life quotes and more rants. Parenthood. My kids are invading my Facebook and Instagram! I even had to set my Instagram account to private. I've also become active in Twitter since I became a parent cause I'm trying my best (keyword: trying) to spare my FB with all the rants. Single Life. The reason I started out a blog was because I love to make random write-ups. My first blog was entitled "time waits for no one.." with URL http://www.ayisharu.blogspot.com. It contained melodramatic posts about almost anything (even a stuck takyan). Then I renamed it to "Ayisharu [dot] com" with URL http://www.ayisharu.com with more meaningful and maybe useful posts such as food trips and travels. Parenthood. It took me 10 years to finally decide on a niche and find a topic I would love to talk about! After my domain (which I used for nearly 6 years) expired, I purchased another which is the one I am currently using: www.outofneverland.com and renamed my blog to "Out of Never Land". Now, I will be writing more about my musings on married life and parenthood. One mommy blogger (Ubengbaka Joy of The Purple Cow Adventures) also shared hers. "My spending! Before I was kuripot and can easily tell myself I do not need something that I want especially if it's expensive. When I became a mom, the line between needs and wants became blurry already. I would spend on my blub without second thoughts. If it's expensive, I would justify the purchase. My diet. Before pregnancy, I was a pescatarian / semi-vegetarian. But when I became pregnant, I introduced chicken and sometimes beef to my diet. Because I felt my son needed the nutrients from meat. Until now I never got back to being a pescatarian." If you also wish to share your own personal changes from single life to parenthood, feel free to drop a message or comment below.